I can’t remember the last time I ventured out the day following Christmas but today I did just that. Typically, being a teacher and school being out of session, I would be home reading a new book I received on Christmas day while sipping on a warm cup of hot chocolate. . . Nat King Cole softly singing “The Christmas Song” from the stereo. . . Stereo??? What’s that?? Oh my, am I giving away my age? But this weekend we are going as a family to the little village of Leavenworth, Washington nestled up in the foothills of the Cascade mountains. Bedecked in its twinkling Christmas lights, the Bavarian styled village draws us every year as a family to spend 4 delicious nights of relaxation. I needed to get to a local retail shop to exchange some soft furry slippers I had purchased for my wife and daughters. I wanted them to have them for the trip. Imagine my surprise when I entered the shop only to see literally hundreds of consumers frantically ripping Christmas ornaments and wrapping from the shelves for the yearly after Christmas 50% off sale. What was a wonderful little shop just a few days ago festooned with Christmas lights and cheer had become a scene of chaotic activity. No longer were the lights twinking or the holiday music playing. Employees were rapidly taking down the display fixtures and were already in the process of constructing “EASTER” themed displays!!! . . . Little bags of Cadbury eggs were sitting in their little straw nests. . . . Chocolate bunnies were hopping about . . . .and everything pastel was quickly replacing the traditional Red and Green. What had happened? Sadly, what happened was that for most people Christmas was over. . . sigh . . . . We speak of Christmas time, of the Holiday Season but what, exactly, does that mean. Let’s take a little trip to Wikipedia, the source of all information, to find out just what defines the Christmas season. According to Wikipedia: The Christmas season, also called the holiday season (especially in the U.S. and Canada),the festive season, or simply the holidays, is an annually-recurring period recognized in many Western and Western-influenced countries that is generally considered to run from late November to early January, defined as incorporating at least Christmas and usually New Year, and sometimes various other holidays and festivals. It incorporates a period of shopping which comprises a peak season for the retail sector (the “Christmas (or holiday) shopping season”), and a period of sales at the end of the season (the “January sales”). Originally, the term “Christmas season” was considered synonymous with Christmastide, a term itself derived from Yuletide, which runs from December 25 (Christmas Day) to January 6 (Epiphany), popularly known as the 12 Days of Christmas. However, as the economic impact involving the anticipatory lead-up to Christmas Day grew in America and Europe into the 19th and 20th centuries, the term “Christmas season” began to become synonymous instead with the traditional Christian Advent season, the period observed in Western Christianity from the fourth Sunday before Christmas Day until Christmas Day itself. The term “Advent calendar” survives in secular Western parlance as a term referring to a countdown to Christmas Day from the beginning of December. So there you have it. Christmas season is defined by retail sales . . . arghhhhh . . . . Within our family and our circle of friends we always continue to celebrate the Christmas season up to include Epiphany on January 6. Therefore, the songs don’t just end of Christmas day. . . They carry on . . . We have a local smooth jazz station that plays Christmas music from Thanksgiving day on but come midnight on Christmas day they go back to playing smooth jazz. . . the season is over. Well, for those of us who continue to celebrate lets keep the music alive. Sing those carols and popular holiday songs . . . play the tunes on piano and guitar and ukulele or whatever instrument comes to hand. 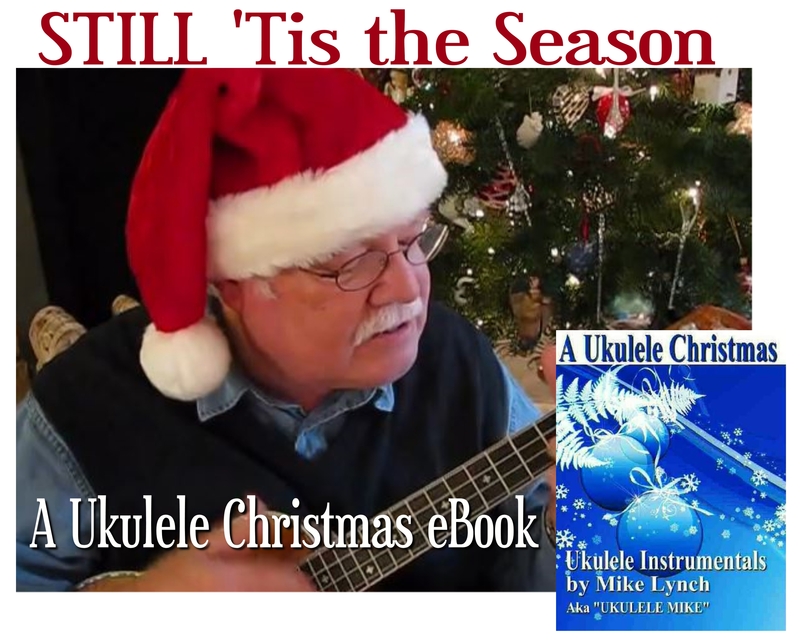 To assist in that I have compiled an eBook which is actually 2 books in one “A UKULELE CHRISTMAS” The first section contains numerous solo ukulele arrangements of classic and popular Christmas carols and songs. The second book consists of Sing a long songs with ukulele accompaniment. Actually, one could also use the book for Guitar, Mandolin, banjo, Piano etc. . . I’ve given suggested strumming patterns and arranged the songs in uke friendly keys.